1. The Master said, 'Is it not pleasant to learn with a constant perseverance and application? 1. The philosopher Yu said, 'They are few who, being filial and fraternal, are fond of offending against their superiors. There have been none, who, not liking to offend against their superiors, have been fond of stirring up confusion. 1. The Master said, 'If the scholar be not grave, he will not call forth any veneration, and his learning will not be solid. 2. 'Hold faithfulness and sincerity as first principles. 3. 'Have no friends not equal to yourself. 1. The philosopher Yu said, 'In practicing the rules of propriety, a natural ease is to be prized. In the ways prescribed by the ancient kings, this is the excellent quality, and in things small and great we follow them. 1. The Master said, 'If the people be led by laws, and uniformity sought to be given them by punishments, they will try to avoid the punishment, but have no sense of shame. 1. The Master said, 'At fifteen, I had my mind bent on learning. 2. 'At thirty, I stood firm. 3. 'At forty, I had no doubts. 4. 'At fifty, I knew the decrees of Heaven. 1. The Master said, 'See what a man does. 3. 'Examine in what things he rests. 1. Tsze-chang was learning with a view to official emolument. 1. The Master said, 'For a man to sacrifice to a spirit which does not belong to him is flattery. 1. Lin Fang asked what was the first thing to be attended to in ceremonies. 2. The Master said, 'A great question indeed! 3. 'In festive ceremonies, it is better to be sparing than extravagant. Some one asked the meaning of the great sacrifice. The Master said, 'I do not know. He who knew its meaning would find it as easy to govern the kingdom as to look on this;-- pointing to his palm. 1. He sacrificed to the dead, as if they were present. He sacrificed to the spirits, as if the spirits were present. 1. Tsze-kung wished to do away with the offering of a sheep connected with the inauguration of the first day of each month. The Master said of the Shao that it was perfectly beautiful and also perfectly good. He said of the Wu that it was perfectly beautiful but not perfectly good. 1.The Master said, 'Riches and honours are what men desire. If it cannot be obtained in the proper way, they should not be held. Poverty and meanness are what men dislike. If it cannot be avoided in the proper way, they should not be avoided. 1. The Master said, 'I have not seen a person who loved virtue, or one who hated what was not virtuous. He who loved virtue, would esteem nothing above it. He who hated what is not virtuous, would practise virtue in such a way that he would not allow anything that is not virtuous to approach his person. 2. 'Is any one able for one day to apply his strength to virtue? I have not seen the case in which his strength would be insufficient. 1. The Master said of Kung-ye Ch'ang that he might be wived; although he was put in bonds, he had not been guilty of any crime. Accordingly, he gave him his own daughter to wife. 2. Of Nan Yung he said that if the country were well governed he would not be out of office, and if it were ill-governed, he would escape punishment and disgrace. He gave him the daughter of his own elder brother to wife. The Master was wishing Ch'i-tiao K'ai to enter on official employment. He replied, 'I am not yet able to rest in the assurance of THIS.' The Master was pleased. When Tsze-lu heard anything, if he had not yet succeeded in carrying it into practice, he was only afraid lest he should hear something else. 1. Tsze-hwa being employed on a mission to Ch'i, the disciple Zan requested grain for his mother. The Master said, 'Give her a fu.' Yen requested more. 'Give her an yu,' said the Master. Yen gave her five ping. 1. Tsze-kung said, 'Suppose the case of a man extensively conferring benefits on the people, and able to assist all, what would you say of him? Might he be called perfectly virtuous?' The Master said, 'Why speak only of virtue in connexion with him? Must he not have the qualities of a sage? Even Yao and Shun were still solicitous about this. 2. 'Now the man of perfect virtue, wishing to be established himself, seeks also to establish others; wishing to be enlarged himself, he seeks also to enlarge others. When the Master was unoccupied with business, his manner was easy, and he looked pleased. 1. The Master said, 'Let the will be set on the path of duty. 2. 'Let every attainment in what is good be firmly grasped. 3. 'Let perfect virtue be accorded with. 1. When the Master was eating by the side of a mourner, he never ate to the full. 2. He did not sing on the same day in which he had been weeping. The things in reference to which the Master exercised the greatest caution were -- fasting, war, and sickness. The Master's frequent themes of discourse were-- the Odes, the History, and the maintenance of the Rules of Propriety. On all these he frequently discoursed. 1. The Duke of Sheh asked Tsze-lu about Confucius, and Tsze-lu did not answer him. The subjects on which the Master did not talk, were-- extraordinary things, feats of strength, disorder, and spiritual beings. There were four things which the Master taught,-- letters, ethics, devotion of soul, and truthfulness. 2. The Master said, 'A good man it is not mine to see; could I see a man possessed of constancy, that would satisfy me. The Master angled,-- but did not use a net. He shot,-- but not at birds perching. 1. It was difficult to talk (profitably and reputably) with the people of Hu-hsiang, and a lad of that place having had an interview with the Master, the disciples doubted. When the Master was in company with a person who was singing, if he sang well, he would make him repeat the song, while he accompanied it with his own voice. The Master said, 'The superior man is satisfied and composed; the mean man is always full of distress.' CHAP. XXXVII. The Master was mild, and yet dignified; majestic, and yet not fierce; respectful, and yet easy. 1. The Master said, 'Respectfulness, without the rules of propriety, becomes laborious bustle; carefulness, without the rules of propriety, becomes timidity; boldness, without the rules of propriety, becomes insubordination; straightforwardness, without the rules of propriety, becomes rudeness. 1. The philosopher Tsang being ill, Meng Chang went to ask how he was. 2. Tsang said to him, 'When a bird is about to die, its notes are mournful; when a man is about to die, his words are good. 1. The philosopher Tsang said, 'The officer may not be without breadth of mind and vigorous endurance. His burden is heavy and his course is long. 2. 'Perfect virtue is the burden which he considers it is his to sustain;-- is it not heavy? Only with death does his course stop;-- is it not long? 1. The Master said, 'It is by the Odes that the mind is aroused. 2. 'It is by the Rules of Propriety that the character is established. 1. The Master said, 'With sincere faith he unites the love of learning; holding firm to death, he is perfecting the excellence of his course. 2. 'Such an one will not enter a tottering State, nor dwell in a disorganized one. When right principles of government prevail in the kingdom, he will show himself; when they are prostrated, he will keep concealed. 1. The Master said, 'Great indeed was Yao as a sovereign! How majestic was he! It is only Heaven that is grand, and only Yao corresponded to it. How vast was his virtue! The people could find no name for it. 1. Shun had five ministers, and the empire was well-governed. 3. Confucius said, 'Is not the saying that talents are difficult to find, true? Only when the dynasties of T'ang and Yu met, were they more abundant than in this of Chau, yet there was a woman among them. The able ministers were no more than nine men. 1. The Master said, 'The linen cap is that prescribed by the rules of ceremony, but now a silk one is worn. It is economical, and I follow the common practice. CHAP. IV. There were four things from which the Master was entirely free. He had no foregone conclusions, no arbitrary predeterminations, no obstinacy, and no egoism. 1. The Master was put in fear in K'wang. 2. He said, 'After the death of King Wan, was not the cause of truth lodged here in me? When the Master saw a person in a mourning dress, or any one with the cap and upper and lower garments of full dress, or a blind person, on observing them approaching, though they were younger than himself, he would rise up, and if he had to pass by them, he would do so hastily. 1. Yen Yuan, in admiration of the Master's doctrines, sighed and said, 'I looked up to them, and they seemed to become more high; I tried to penetrate them, and they seemed to become more firm; I looked at them before me, and suddenly they seemed to be behind. 2. 'The Master, by orderly method, skilfully leads men on. He enlarged my mind with learning, and taught me the restraints of propriety. 1. The Master being very ill, Tsze-lu wished the disciples to act as ministers to him. 2. During a remission of his illness, he said, 'Long has the conduct of Yu been deceitful! By pretending to have ministers when I have them not, whom should I impose upon? Should I impose upon Heaven? 1. The Master was wishing to go and live among the nine wild tribes of the east. 1. The Master said, 'Dressed himself in a tattered robe quilted with hemp, yet standing by the side of men dressed in furs, and not ashamed;-- ah! it is Yu who is equal to this! 1. How the flowers of the aspen-plum flutter and turn! Do I not think of you? But your house is distant. 1. Confucius, in his village, looked simple and sincere, and as if he were not able to speak. 2. When he was in the prince's ancestorial temple, or in the court, he spoke minutely on every point, but cautiously. 1. When he was waiting at court, in speaking with the great officers of the lower grade, he spake freely, but in a straightforward manner; in speaking with those of the higher grade, he did so blandly, but precisely. 2. When the ruler was present, his manner displayed respectful uneasiness; it was grave, but self-possessed. 1. When the prince called him to employ him in the reception of a visitor, his countenance appeared to change, and his legs to move forward with difficulty. 2. He inclined himself to the other officers among whom he stood, moving his left or right arm, as their position required, but keeping the skirts of his robe before and behind evenly adjusted. 3. He hastened forward, with his arms like the wings of a bird. 1. When he entered the palace gate, he seemed to bend his body, as if it were not sufficient to admit him. 2. When he was standing, he did not occupy the middle of the gate-way; when he passed in or out, he did not tread upon the threshold. 3. When he was passing the vacant place of the prince, his countenance appeared to change, and his legs to bend under him, and his words came as if he hardly had breath to utter them. 4. He ascended the reception hall, holding up his robe with both his hands, and his body bent; holding in his breath also, as if he dared not breathe. 5. When he came out from the audience, as soon as he had descended one step, he began to relax his countenance, and had a satisfied look. When he had got to the bottom of the steps, he advanced rapidly to his place, with his arms like wings, and on occupying it, his manner still showed respectful uneasiness. 1. When he was carrying the scepter of his ruler, he seemed to bend his body, as if he were not able to bear its weight. He did not hold it higher than the position of the hands in making a bow, nor lower than their position in giving anything to another. His countenance seemed to change, and look apprehensive, and he dragged his feet along as if they were held by something to the ground. 2. In presenting the presents with which he was charged, he wore a placid appearance. 3. At his private audience, he looked highly pleased. 1. The superior man did not use a deep purple, or a puce colour, in the ornaments of his dress. 2. Even in his undress, he did not wear anything of a red or reddish colour. 3. In warm weather, he had a single garment either of coarse or fine texture, but he wore it displayed over an inner garment. 4. Over lamb's fur he wore a garment of black; over fawn's fur one of white; and over fox's fur one of yellow. 5. The fur robe of his undress was long, with the right sleeve short. 6. He required his sleeping dress to be half as long again as his body. 7. When staying at home, he used thick furs of the fox or the badger. 8. When he put off mourning, he wore all the appendages of the girdle. 9. His under-garment, except when it was required to be of the curtain shape, was made of silk cut narrow above and wide below. 10. He did not wear lamb's fur or a black cap, on a visit of condolence. 11. On the first day of the month he put on his court robes, and presented himself at court. 1. When fasting, he thought it necessary to have his clothes brightly clean and made of linen cloth. 2. When fasting, he thought it necessary to change his food, and also to change the place where he commonly sat in the apartment. 1. He did not dislike to have his rice finely cleaned, nor to have his minced meat cut quite small. 2. He did not eat rice which had been injured by heat or damp and turned sour, nor fish or flesh which was gone. He did not eat what was discoloured, or what was of a bad flavour, nor anything which was ill-cooked, or was not in season. 3. He did not eat meat which was not cut properly, nor what was served without its proper sauce. 4. Though there might be a large quantity of meat, he would not allow what he took to exceed the due proportion for the rice. It was only in wine that he laid down no limit for himself, but he did not allow himself to be confused by it. 5. He did not partake of wine and dried meat bought in the market. 6. He was never without ginger when he ate. 7. He did not eat much. 8. When he had been assisting at the prince's sacrifice, he did not keep the flesh which he received overnight. The flesh of his family sacrifice he did not keep over three days. If kept over three days, people could not eat it. 9. When eating, he did not converse. When in bed, he did not speak. 10. Although his food might be coarse rice and vegetable soup, he would offer a little of it in sacrifice with a grave, respectful air. If his mat was not straight, he did not sit on it. 1. When the villagers were drinking together, on those who carried staffs going out, he went out immediately after. 2. When the villagers were going through their ceremonies to drive away pestilential influences, he put on his court robes and stood on the eastern steps. 1. When he was sending complimentary inquiries to any one in another State, he bowed twice as he escorted the messenger away. The stable being burned down, when he was at court, on his return he said, 'Has any man been hurt?' He did not ask about the horses. 1. When the prince sent him a gift of cooked meat, he would adjust his mat, first taste it, and then give it away to others. When the prince sent him a gift of undressed meat, he would have it cooked, and offer it to the spirits of his ancestors. When the prince sent him a gift of a living animal, he would keep it alive. 2. When he was in attendance on the prince and joining in the entertainment, the prince only sacrificed. He first tasted everything. 3. When he was ill and the prince came to visit him, he had his head to the east, made his court robes be spread over him, and drew his girdle across them. 4. When the prince's order called him, without waiting for his carriage to be yoked, he went at once. When he entered the ancestral temple of the State, he asked about everything. 2. When a friend sent him a present, though it might be a carriage and horses, he did not bow. 3. The only present for which he bowed was that of the flesh of sacrifice. 1. In bed, he did not lie like a corpse. At home, he did not put on any formal deportment. 2. When he saw any one in a mourning dress, though it might be an acquaintance, he would change countenance; when he saw any one wearing the cap of full dress, or a blind person, though he might be in his undress, he would salute them in a ceremonious manner. 3. To any person in mourning he bowed forward to the crossbar of his carriage; he bowed in the same way to any one bearing the tables of population. 4. When he was at an entertainment where there was an abundance of provisions set before him, he would change countenance and rise up. 5. On a sudden clap of thunder, or a violent wind, he would change countenance. 1. When he was about to mount his carriage, he would stand straight, holding the cord. 2. When he was in the carriage, he did not turn his head quite round, he did not talk hastily, he did not point with his hands. 1. Seeing the countenance, it instantly rises. It flies round, and by and by settles. 2. The Master said, 'There is the hen-pheasant on the hill bridge. At its season! At its season!' Tsze-lu made a motion to it. Thrice it smelt him and then rose. 2. Distinguished for their virtuous principles and practice, there were Yen Yuan, Min Tsze-ch'ien, Zan Po-niu, and Chung-kung; for their ability in speech, Tsai Wo and Tsze-kung; for their adminis-trative talents, Zan Yu and Chi Lu; for their literary acquirements, Tsze-yu and Tsze-hsia. Nan Yung was frequently repeating the lines about a white scepter stone. Confucius gave him the daughter of his elder brother to wife. 1. When Yen Yuan died, Yen Lu begged the carriage of the Master to sell and get an outer shell for his son's coffin. 2. 'Is it excessive?' said he. 1. The disciple Min was standing by his side, looking bland and precise; Tsze-lu, looking bold and soldierly; Zan Yu and Tsze-kung, with a free and straightforward manner. The Master was pleased. 1. Some parties in Lu were going to take down and rebuild the Long Treasury. 1. The head of the Chi family was richer than the duke of Chau had been, and yet Ch'iu collected his imposts for him, and increased his wealth. 1. The Master said, 'There is Hui! He has nearly attained to perfect virtue. He is often in want. 1. Chi Tsze-zan asked whether Chung Yu and Zan Ch'iu could be called great ministers. 2. The Master said, 'I thought you would ask about some extraordinary individuals, and you only ask about Yu and Ch'iu! 3. 'What is called a great minister, is one who serves his prince according to what is right, and when he finds he cannot do so, retires. 1. Tsze-lu got Tsze-kao appointed governor of Pi. 1. Tsze-lu, Tsang Hsi, Zan Yu, and Kung-hsi Hwa were sitting by the Master. 2. He said to them, 'Though I am a day or so older than you, do not think of that. 4. Tsze-lu hastily and lightly replied, 'Suppose the case of a State of ten thousand chariots; let it be straitened between other large States; let it be suffering from invading armies; and to this let there be added a famine in corn and in all vegetables:-- if I were intrusted with the government of it, in three years' time I could make the people to be bold, and to recognise the rules of righteous conduct.' The Master smiled at him. 12. Once more, Hsi inquired, 'And was it not a State which Ch'ih proposed for himself?' The Master again replied, 'Yes; who but princes have to do with ancestral temples, and with audiences but the sovereign? If Ch'ih were to be a small assistant in these services, who could be a great one? 1. Sze-ma Niu asked about perfect virtue. 3. '"Death and life have their determined appointment; riches and honours depend upon Heaven." 2. Tsze-kung said, 'If it cannot be helped, and one of these must be dispensed with, which of the three should be foregone first?' 'The military equipment,' said the Master. 2. Tsze-kung said, 'Alas! Your words, sir, show you to be a superior man, but four horses cannot overtake the tongue. 1. Tsze-chang having asked how virtue was to be exalted, and delusions to be discovered, the Master said, 'Hold faithfulness and sincerity as first principles, and be moving continually to what is right;-- this is the way to exalt one's virtue. 2. 'You love a man and wish him to live; you hate him and wish him to die. Having wished him to live, you also wish him to die. This is a case of delusion. 1. The Duke Ching, of Ch'i, asked Confucius about government. 4. The Master said, 'That is notoriety, not distinction. 5. 'Now the man of distinction is solid and straightforward, and loves righteousness. He examines people's words, and looks at their countenances. He is anxious to humble himself to others. Such a man will be distinguished in the country; he will be distinguished in his clan. 2. The Master said, 'Truly a good question! 2. Fan Ch'ih did not immediately understand these answers. 4. The Master said, 'How uncultivated you are, Yu! A superior man, in regard to what he does not know, shows a cautious reserve. 5. 'If names be not correct, language is not in accordance with the truth of things. If language be not in accordance with the truth of things, affairs cannot be carried on to success. 6. 'When affairs cannot be carried on to success, proprieties and music will not flourish. When proprieties and music do not flourish, punishments will not be properly awarded. When punishments are not properly awarded, the people do not know how to move hand or foot. 1. When the Master went to Wei, Zan Yu acted as driver of his carriage. 3. Yu said, 'Since they are thus numerous, what more shall be done for them?' 'Enrich them,' was the reply. 1. The Duke Ting asked whether there was a single sentence which could make a country prosperous. Confucius replied, 'Such an effect cannot be expected from one sentence. 2. 'There is a saying, however, which people have-- "To be a prince is difficult; to be a minister is not easy." 4. The duke then said, 'Is there a single sentence which can ruin a country?' Confucius replied, 'Such an effect as that cannot be expected from one sentence. There is, however, the saying which people have-- "I have no pleasure in being a prince, but only in that no one can offer any opposition to what I say!" 1. The Duke of Sheh asked about government. 1. Chan Ch'ang murdered the Duke Chien of Ch'i. 1. Chu Po-yu sent a messenger with friendly inquiries to Confucius. 1. The Master said, 'The way of the superior man is threefold, but I am not equal to it. Virtuous, he is free from anxieties; wise, he is free from perplexities; bold, he is free from fear. 2. The Master said, 'With what then will you recompense kindness? 1. The Master said, 'Some men of worth retire from the world. 2. Some retire from particular states. 3. Some retire because of disrespectful looks. Yuan Zang was squatting on his heels, and so waited the approach of the Master, who said to him, 'In youth not humble as befits a junior; in manhood, doing nothing worthy of being handed down; and living on to old age:-- this is to be a pest.' With this he hit him on the shank with his staff. BOOK XV. WEI LING KUNG. 1. The Duke Ling of Wei asked Confucius about tactics. Confucius replied, 'I have heard all about sacrificial vessels, but I have not learned military matters.' On this, he took his departure the next day. 2. When he was in Chan, their provisions were exhausted, and his followers became so ill that they were unable to rise. 1. Tsze-chang asked how a man should conduct himself, so as to be everywhere appreciated. 2. The Master said, 'Let his words be sincere and truthful, and his actions honourable and careful;-- such conduct may be practised among the rude tribes of the South or the North. If his words be not sincere and truthful and his actions not honourable and careful, will he, with such conduct, be appreciated, even in his neighborhood? 4. Tsze-chang wrote these counsels on the end of his sash. 1. The Master said, 'Truly straightforward was the historiographer Yu. When good government prevailed in his State, he was like an arrow. When bad government prevailed, he was like an arrow. 1. Yen Yuan asked how the government of a country should be administered. 2. The Master said, 'Follow the seasons of Hsia. 3. 'Ride in the state carriage of Yin. 4. 'Wear the ceremonial cap of Chau. 5. 'Let the music be the Shao with its pantomimes. 1. The Master said, 'In my dealings with men, whose evil do I blame, whose goodness do I praise, beyond what is proper? If I do sometimes exceed in praise, there must be ground for it in my examination of the individual. 1. The Master said, 'When a man's knowledge is sufficient to attain, and his virtue is not sufficient to enable him to hold, whatever he may have gained, he will lose again. 2. 'When his knowledge is sufficient to attain, and he has virtue enough to hold fast, if he cannot govern with dignity, the people will not respect him. 1. The head of the Chi family was going to attack Chwan-yu. 3. Confucius said, 'Ch'iu, is it not you who are in fault here? 6. Confucius said, 'Ch'iu, there are the words of Chau Zan,-- "When he can put forth his ability, he takes his place in the ranks of office; when he finds himself unable to do so, he retires from it. How can he be used as a guide to a blind man, who does not support him when tottering, nor raise him up when fallen?" 9. Confucius said. 'Ch'iu, the superior man hates that declining to say-- "I want such and such a thing," and framing explanations for the conduct. 10. 'I have heard that rulers of States and chiefs of families are not troubled lest their people should be few, but are troubled lest they should not keep their several places; that they are not troubled with fears of poverty, but are troubled with fears of a want of contented repose among the people in their several places. For when the people keep their several places, there will be no poverty; when harmony prevails, there will be no scarcity of people; and when there is such a contented repose, there will be no rebellious upsettings. 11. 'So it is.-- Therefore, if remoter people are not submissive, all the influences of civil culture and virtue are to be cultivated to attract them to be so; and when they have been so attracted, they must be made contented and tranquil. 12. 'Now, here are you, Yu and Ch'iu, assisting your chief. Remoter people are not submissive, and, with your help, he cannot attract them to him. In his own territory there are divisions and downfalls, leavings and separations, and, with your help, he cannot preserve it. 1. 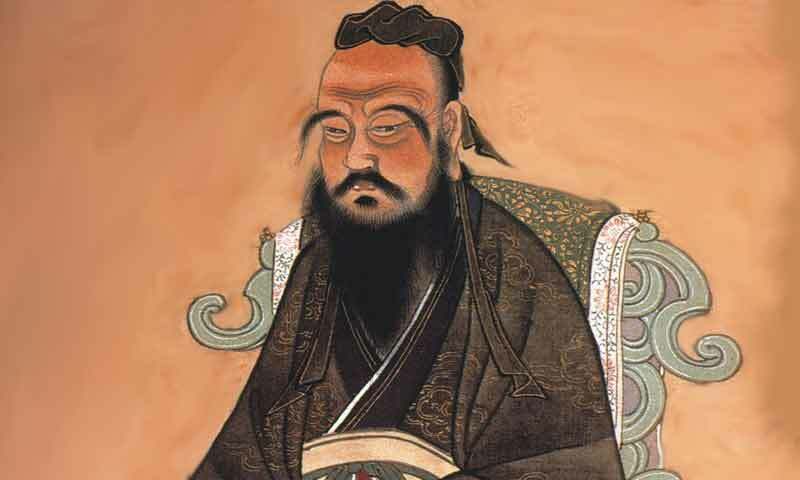 Confucius said, 'When good government prevails in the empire, ceremonies, music, and punitive military expeditions proceed from the son of Heaven. When bad government prevails in the empire, ceremonies, music, and punitive military expeditions proceed from the princes. When these things proceed from the princes, as a rule, the cases will be few in which they do not lose their power in ten generations. When they proceed from the Great officers of the princes, as a rule, the cases will be few in which they do not lose their power in five generations. When the subsidiary ministers of the great officers hold in their grasp the orders of the state, as a rule, the cases will be few in which they do not lose their power in three generations. 1. Confucius said, 'There are three things of which the superior man stands in awe. He stands in awe of the ordinances of Heaven. He stands in awe of great men. He stands in awe of the words of sages. 2. Po-yu replied, 'No. He was standing alone once, when I passed below the hall with hasty steps, and said to me, "Have you learned the Odes?" On my replying "Not yet," he added, "If you do not learn the Odes, you will not be fit to converse with." I retired and studied the Odes. 3. 'Another day, he was in the same way standing alone, when I passed by below the hall with hasty steps, and said to me, 'Have you learned the rules of Propriety?' On my replying 'Not yet,' he added, 'If you do not learn the rules of Propriety, your character cannot be established.' I then retired, and learned the rules of Propriety. 1. Yang Ho wished to see Confucius, but Confucius would not go to see him. On this, he sent a present of a pig to Confucius, who, having chosen a time when Ho was not at home, went to pay his respects for the gift. He met him, however, on the way. 1. The Master, having come to Wu-ch'ang, heard there the sound of stringed instruments and singing. 1.Kung-shan Fu-zao, when he was holding Pi, and in an attitude of rebellion, invited the Master to visit him, who was rather inclined to go. 3. The Master said, 'Can it be without some reason that he has invited ME? If any one employ me, may I not make an eastern Chau?' CHAP. VI. Tsze-chang asked Confucius about perfect virtue. Confucius said, 'To be able to practise five things everywhere under heaven constitutes perfect virtue.' He begged to ask what they were, and was told, 'Gravity, generosity of soul, sincerity, earnestness, and kindness. If you are grave, you will not be treated with disrespect. If you are generous, you will win all. If you are sincere, people will repose trust in you. If you are earnest, you will accomplish much. If you are kind, this will enable you to employ the services of others. 1. Pi Hsi inviting him to visit him, the Master was inclined to go. 3. The Master said, 'Yes, I did use these words. But is it not said, that, if a thing be really hard, it may be ground without being made thin? Is it not said, that, if a thing be really white, it may be steeped in a dark fluid without being made black? 1. The Master said, 'My children, why do you not study the Book of Poetry? 2. 'The Odes serve to stimulate the mind. 3. 'They may be used for purposes of self-contemplation. 4. 'They teach the art of sociability. 5. 'They show how to regulate feelings of resentment. 6. 'From them you learn the more immediate duty of serving one's father, and the remoter one of serving one's prince. 1. The Master said, 'There are those mean creatures! How impossible it is along with them to serve one's prince! 2. 'While they have not got their aims, their anxiety is how to get them. When they have got them, their anxiety is lest they should lose them. 1. The Master said, 'Anciently, men had three failings, which now perhaps are not to be found. Zu Pei wished to see Confucius, but Confucius declined, on the ground of being sick, to see him. When the bearer of this message went out at the door, (the Master) took his lute and sang to it, in order that Pei might hear him. 1. Tsai Wo asked about the three years' mourning for parents, saying that one year was long enough. 2. 'If the superior man,' said he, 'abstains for three years from the observances of propriety, those observances will be quite lost. If for three years he abstains from music, music will be ruined. 4. The Master said, 'If you were, after a year, to eat good rice, and wear embroidered clothes, would you feel at ease?' 'I should,' replied Wo. 1. The Viscount of Wei withdrew from the court. The Viscount of Chi became a slave to Chau. Pi-kan remonstrated with him and died. The duke Ching of Ch'i, with reference to the manner in which he should treat Confucius, said, 'I cannot treat him as I would the chief of the Chi family. I will treat him in a manner between that accorded to the chief of the Chi, and that given to the chief of the Mang family.' He also said, 'I am old; I cannot use his doctrines.' Confucius took his departure. 2. Confucius alighted and wished to converse with him, but Chieh-yu hastened away, so that he could not talk with him. 1. Ch'ang-tsu and Chieh-ni were at work in the field together, when Confucius passed by them, and sent Tsze-lu to inquire for the ford. 3. Tsze-lu then inquired of Chieh-ni, who said to him, 'Who are you, sir?' He answered, 'I am Chung Yu.' 'Are you not the disciple of K'ung Ch'iu of Lu?' asked the other. 'I am,' replied he, and then Chieh-ni said to him, 'Disorder, like a swelling flood, spreads over the whole empire, and who is he that will change its state for you? Than follow one who merely withdraws from this one and that one, had you not better follow those who have withdrawn from the world altogether?' With this he fell to covering up the seed, and proceeded with his work, without stopping. 1. Tsze-lu, following the Master, happened to fall behind, when he met an old man, carrying across his shoulder on a staff a basket for weeds. Tsze-lu said to him, 'Have you seen my master, sir!' The old man replied, 'Your four limbs are unaccustomed to toil; you cannot distinguish the five kinds of grain:-- who is your master?' With this, he planted his staff in the ground, and proceeded to weed. 2. Tsze-lu joined his hands across his breast, and stood before him. 3. The old man kept Tsze-lu to pass the night in his house, killed a fowl, prepared millet, and feasted him. He also introduced to him his two sons. 4. Next day, Tsze-lu went on his way, and reported his adventure. The Master said, 'He is a recluse,' and sent Tsze-lu back to see him again, but when he got to the place, the old man was gone. 1. The men who have retired to privacy from the world have been Po-i, Shu-ch'i, Yu-chung, I-yi, Chu-chang, Hui of Liu-hsia, and Shao-lien. 2. The Master said, 'Refusing to surrender their wills, or to submit to any taint in their persons;-- such, I think, were Po-i and Shu-ch'i. 3. 'It may be said of Hui of Liu-hsia, and of Shao-lien, that they surrendered their wills, and submitted to taint in their persons, but their words corresponded with reason, and their actions were such as men are anxious to see. This is all that is to be remarked in them. 4. 'It may be said of Yu-chung and I-yi, that, while they hid themselves in their seclusion, they gave a license to their words; but, in their persons, they succeeded in preserving their purity, and, in their retirement, they acted according to the exigency of the times. 1. The grand music master, Chih, went to Ch'i. 2. Kan, the master of the band at the second meal, went to Ch'u. Liao, the band master at the third meal, went to Ts'ai. Chueh, the band master at the fourth meal, went to Ch'in. 3. Fang-shu, the drum master, withdrew to the north of the river. 4. Wu, the master of the hand drum, withdrew to the Han. 5. Yang, the assistant music master, and Hsiang, master of the musical stone, withdrew to an island in the sea. To Chau belonged the eight officers, Po-ta, Po-kwo, Chung-tu, Chung-hwu, Shu-ya, Shu-hsia, Chi-sui, and Chi-kwa. 2. Tsze-fu Ching-po reported the observation to Tsze-kung, who said, 'Let me use the comparison of a house and its encompassing wall. My wall only reaches to the shoulders. One may peep over it, and see whatever is valuable in the apartments. 3. 'The wall of my Master is several fathoms high. If one do not find the door and enter by it, he cannot see the ancestral temple with its beauties, nor all the officers in their rich array. Shu-sun Wu-shu having spoken revilingly of Chung-ni, Tsze-kung said, 'It is of no use doing so. Chung-ni cannot be reviled. The talents and virtue of other men are hillocks and mounds which may be stepped over. Chung-ni is the sun or moon, which it is not possible to step over. Although a man may wish to cut himself off from the sage, what harm can he do to the sun or moon? He only shows that he does not know his own capacity. 2. Tsze-kung said to him, 'For one word a man is often deemed to be wise, and for one word he is often deemed to be foolish. We ought to be careful indeed in what we say. 3. 'Our Master cannot be attained to, just in the same way as the heavens cannot be gone up to by the steps of a stair. 2. Shun also used the same language in giving charge to Yu. 4. Chau conferred great gifts, and the good were enriched. 6. He carefully attended to the weights and measures, examined the body of the laws, restored the discarded officers, and the good government of the kingdom took its course. 7. He revived States that had been extinguished, restored families whose line of succession had been broken, and called to office those who had retired into obscurity, so that throughout the kingdom the hearts of the people turned towards him. 8. What he attached chief importance to, were the food of the people, the duties of mourning, and sacrifices. 9. By his generosity, he won all. By his sincerity, he made the people repose trust in him. By his earnest activity, his achievements were great. By his justice, all were delighted. 1. The Master said, 'Without recognising the ordinances of Heaven, it is impossible to be a superior man. 2. 'Without an acquaintance with the rules of Propriety, it is impossible for the character to be established. Source: THE CHINESE CLASSICS (CONFUCIAN ANALECTS) by James Legge. The text has been reformatted by Jayaram V for Hinduwebsite.com. While we have taken every care to reproduce the text accurately, we do not undertake any responsibility for any errors or inaccuracies in reproducing the text.